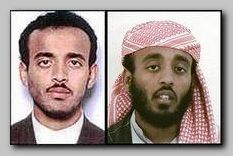 *Ramzi Binalshibh, a member of Al Qaeda, born in Yemen 05/01/1972. From 1987 till 1995 worked as a clerk in the central bank of Yemen. During that time asked for a visa to USA which was denied. As a result he asked for political asylum in Germany, claiming to be a political refugee from Sudan who escaped to Yemen. This demand was not accepted and Ramzi Bilanshibh returned to Yemen to the Hadramaut region. He applied for a students’ visa to Germany which was granted this time . Ramzi Binalshibh lived in Hamburg where he made acquaintance with Mohamed Atta. Together they started a private prayer room which turned in time into Al Qaeda Hamburg Cell. Ramzi Binalshibh shared a flat with Mohamed Atta for 2 years. For that period of time he presented himself as Ramzi Omar. In December 1999 Ramzi Binalshibh traveled to Kandahar, Afganistan, to an Al Qaeda training camp where he met for the first time with Khalid Shaik Mohammed , who already worked on the concept of 9/11. Ramzi Binalshibh became the contact man and coordinator between Khalid Shaik Mohammed and the Hamburg Cell. At that period used the alias Ahad Shabat when transporting money. In 03/01/2000 Ramzi Binalshibh participate in the Kuala Lumpur Convention in malaysia on behalf of Khalid Shaik Mohammed. Throughout 2000 and 2001 he failed to receive visa to USA though he applied for 4 times. Ramzi Binalshibh participated in the final Tarragona Meeting before 9/11, which took place in Spain on 07/16/2001, prior to his return to Afganistan. Ramzi Binalshibh was spotted through wiretapping set up by USA to journalists in Pakistan when he called one of the journalists in an effort to pass a taping of farewell made by performers of the 9/11 attack. Ramzi Binalshibh personally was recognized also on several video tapes seized in Afganistan recording him in company with the perpetrators of 9/11 and chiefs of Al Qaeda (see – Atefs Footages ). Ramzi Binalshibh was arrested in Karachi, Pakistan, after a 3 hours shootout on 9/11/2002. Together with him 8 Yemenites, 2 Saudies, an Egyptian and the wife and daughter of Khalid Shaik Mohammed were arrested. Ramzi Binalshibh is considered to be the coordinator of The 9/11. Few days after arrest Ramzi Binalshibh was extradited to the USA. Ramzi Binalshibh was detained, in 2002 and early 2003, for few months in a CIA secret jail near Rabat, Morocco’s capital, where he was interrogated by CIA agents before he was moved to Guantanamo. * Monday, 01/17/2005 Spanish judge – Baltasar Garzon – issued an order for the arrest of Ramzi Binalshibh and 8 other suspects on the suspicion of falsifying documents which served the perpetrators of Madrid Trains Bombing on 03/11/2004 in Spain. * On Friday 11/13/2009, USA Attorney General Eric Holder announced his decision to abolish the military tribunal track and to pass his case to a federal civilian court in New York City, USA (see -Holders NY Decision ) . * On 08/17/2010 the USA media reported that Ramzi Binalshibh interrogation videotapes have been located showing footage in a secret overseas prison. Discovered under a desk, the recordings could provide an unparalleled look at how foreign governments aided the USA in holding and questioning suspected terrorists. The two videotapes and one audiotape are believed to be the only remaining recordings made within the clandestine prison system (see – Ramzis CIA Videos ). Ramzi Binalshibh made, eventually, his first appearances before the Gitmo Tribunal at the USA base at Guantanamo, on Saturday 05/05/2012.